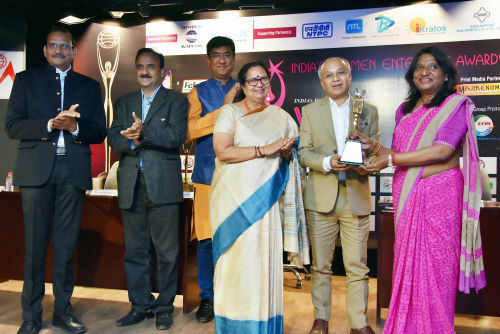 New Delhi, September 20, 2017: Mrs Sushma Paul Berlia, President & Co-Promoter, Apeejay Stya & Svrán Group and the daughter & only child of legendary industrialist & educationist, Late Dr. Stya Paul, was recently honoured ‘Woman Persona of the Decade for Education & Industry’ at India’s Women Enterprise Awards – 2nd inWENA Awards 2017. Mrs Berlia, who is also Chairman, Apeejay Education Society and Chancellor of the Apeejay Stya University, has been a leading voice in the country for the cause of holistic education, skill development, robust business environment and women empowerment. At present, Mrs Sushma Paul Berlia is also the Member of Board, Ministry of Micro, Small & Medium Enterprises (Government of India). Earlier in 2016, Mrs Sushma Paul Berlia was also honoured at the British Parliament for her contribution to industry, education and women empowerment. She has received similar awards from leading apex chambers of India such as Confederation of Indian Industries (CII), Federation of Indian Chambers of Commerce and Industry (FICCI), among many other organisations in India and abroad. Mrs Berlia is also the first ever woman to head a Multi-State Apex Chamber of Commerce of India when she became the President of the PHD Chamber of Commerce & Industry in 2005-06. Dr. Berlia is also the Governing Body Member of the National Board of Accreditation. 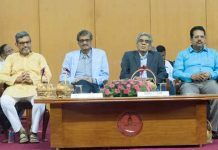 She has also served as the Chairperson, Board of Governors, NIT (National Institute of Technology), Jalandhar and as Member of the Board of Governors of IIT – Roorkee. She is also one of the four members of India on the Executive Committee of ‘Women’s Federation for World Peace’, South Asia. For over two decades, Mrs Berlia has actively championed, at various national and international forums, the cause of education of the girl child, and women’s empowerment in the family, industry and society at large. She has also been in the past nominated to represent India at the ‘Commission of Bio-Tech Society’ by the International Chamber of Commerce. A voracious reader by passion, Mrs Berlia likes travelling and reading philosophical scriptures.